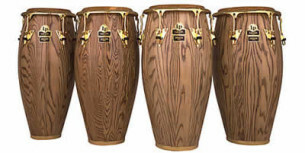 The exclusive Requinto is the most amazing single conga ever, combining 9 3/4 head size, shell contour, and hardware geometry to provide the broadest range of tone available in a single drum. 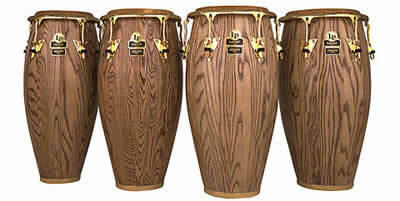 Hand crafted of premium environmentally friendly North American Ash wood, these 30″ tall drums have resonance, attack and warmth found in no other conga. Crafted with LP’s excluside 3-ply construction process, the instruments’ natural colors and tones shine through the rich, deep gloss finish. In response to design specifications from Giovanni, the LP Galaxy Giovanni Series drums feature heavy duty hardware including stronger 3/8″ diameter tuning lugs and reinforced LP Heart Side Plates, each secured with three bolts and a backing plate. They feature gleaming, gold tone hardware and LP’s improved Extended Collar Comfort Curve® II Rims and are topped with all natural hand-picked rawhide heads. Each instrument comes complete with LP Galaxy ProCare Integrated Shell Protectors, an accessory pouch, tuning wrench and LP Lug Lube. This is a special order item – ships in 48 hours.